Orthodontics and Dentofacial Orthopedics is one of nine dental specialties currently sancitoned by the American Dental Association. Other specialty areas you may have heard of include oral surgery, pediatric dentistry (for kids), and endodontics (root canals). Orthodontics and Dentofacial Orthopedics focuses on the diagnosis, prevention, and treatment of dental and facial abnormalities. Every orthodontist first completes 4 years of college and 4 years of dental school to become a general dentist. They then complete at least 2 additional years of a full-time residency program at an accredited university. While all dentists can offer orthodontic services, only orthodontist specialists have received the advanced education to properly diagnosis and treat orthodontic issues. The American Association of Orthodontists recommends that children first visit an orthodontist around the age of seven to screen for possible early preventive treatment; however, orthodontic treatment can be successfully completed at any age. If you want to improve the look and feel of your smile, then any age can be the right age to see the orthodontist. For most people, a beautiful smile is the most obvious benefit of orthodontics. A smile conveys happiness, kindness and confidence to others and is often the first thing someone notices about you. Recent studies have even shown that people with attractive smiles are perceived as being more intelligent and have higher career success. Your dentist may have discussed with you the benefits of having healthy teeth and proper jaw alignment. Crooked and crowded teeth are hard to clean and maintain. This can result in tooth decay, worsen gum disease and lead to tooth loss. Other orthodontic problems can contribute to abnormal wear of tooth surfaces, inefficient chewing, and excessive stress on gum tissue and the bone that supports the teeth. Treatment by an orthodontist can be less costly than the additional care required to treat dental problems arising as a result of orthodontic problems. Orthodontic appliances are made of metal, ceramic, or plastic. They may be removable or they may be brackets bonded to the teeth. By placing a constant, gentle force in a carefully controlled direction, appliances slowly move teeth to the proper position. Treatment time varies and can last between one and three years, depending on several factors including age, treatment method, and how minor or severe your case is. A big factor in a successful treatment is you! The more involved and diligent you are, the more efficient your treatment will be. For children, receiving interceptive or early treatment can sometimes lessen the amount of time needed in braces. 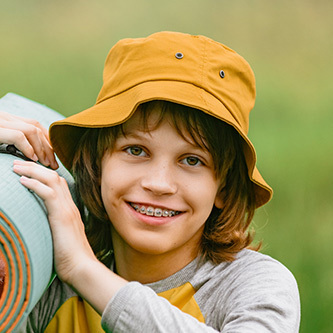 Getting braces does not hurt, though you may feel a small amount of discomfort for a few days after your braces are placed as your teeth, gums, cheeks, and mouth get used to your new braces. With braces, you should brush your teeth at least three times a day to keep your teeth, gums, and mouth healthy and clean. Brushing regularly will help remove any food that may be caught between the braces. You should also floss daily to get in between your teeth where your brush isn't able to reach. Your orthodontist can show you how to properly brush and floss once your braces are placed. Yes! In fact, it's even more important that patients receiving orthodontic treatment visit their dentist regularly. With braces, food may be caught in places that your toothbrush can't reach. This causes bacteria to build up which can lead to cavities, gingivitis, and gum disease. Your dentist will work closely with your orthodontist to make sure that your teeth stay clean and healthy while wearing braces. Playing an instrument or a contact sport may require some adjustment when you first get your braces, but wearing braces will not stop you from participating in any of your school activities. If you play a contact sport, it is recommended that you wear a mouthguard to protect your braces or appliance, which we will be happy to provide for you.